Auto industry experts are talking about the effects a closure of the US-Mexico border would have on the auto industry. 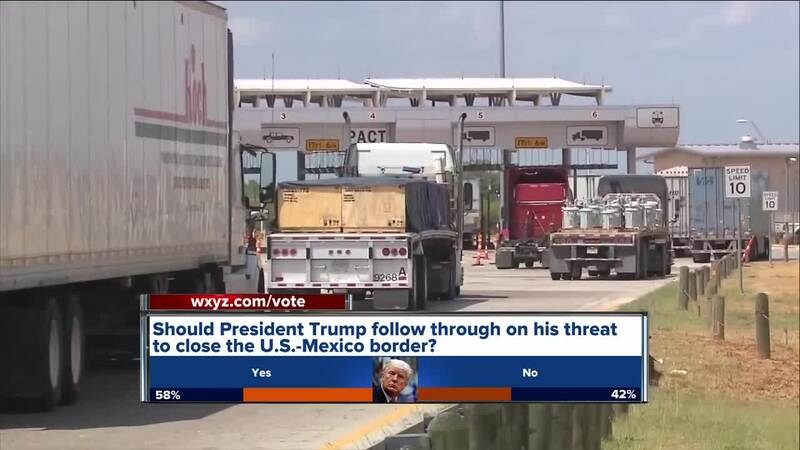 DETROIT (WXYZ) — If President Trump were to close the border to Mexico for security reasons it would be harmful to the automotive industry. We reached out to General Motors, Ford, Fiat Chrysler and the United Auto Workers Union. None of them would give statements in response. “We’re the number one destination for imported auto parts from Mexico. And our exports to the rest of the world, Mexico is our second largest export market,” Dziczek says. She also said US automotive production would shut down within a week and include Canada and Mexico because the countries are so closely connected. Any action that stops commerce at the border would be harmful to the U.S. economy, and in particular, the auto industry. Access to Mexico’s market place and North American integration are critical to operations in the U.S. That is why we are strong supporters of the administration’s USMCA agreement. USMCA is essential to maintaining the competitiveness of the U.S. auto industry and we are urging Congress to pass it without delay.